(TibetanReview.net, Mar04’16) – China has taken away and disappeared on Mar 1 a Tibetan woman in Meuruma (Chinese: Mai’erma) Town of Ngaba (Aba) County, Sichuan Province, within minutes of her taking out a lone street protest against its rule in her homeland. Mangga, 33, carried a portrait of Tibet’s exiled spiritual leader, the Dalai Lama, as she walked along the main road of Meuruma Town around noon to protest against repressive policies of the Chinese government, said Dharamshala-based Tibetan Centre for Human Rights and Democracy Mar 3. 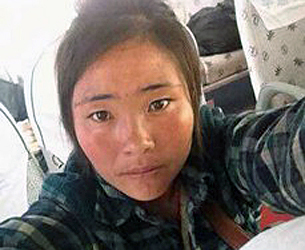 The woman, mother of a 14-year-old daughter named Ghangga Lhamo, has remained disappeared ever since. She is said to be the second youngest among nine siblings. He father’s name is Tsepey and mother’s Pema Kyi. The woman had previously been detained in 2008 when she objected to a Chinese government order to fly the Chinese national flag in her village and sough to confront the local officials who gave that order. At that time she was taken away and interrogated, beaten and tortured for about eight months, the centre said. Ngaba County, especially Meuruma Town, has witnessed numerous lone protests by Tibetans in recent months, all of them ending in the protesters being taken away b y Chinese police, often to disappear. The local people of Ngaba County have remained cut off from internet services since Sep 10, 2015, the centre said. This was in addition to the area being already under military clampdown since the Mar-Apr 2008 Tibet uprising protests.